The Col Becchei is an accessible peak in the Italian Alps that tops out just over 9,000ft, offering budding Italian skiers their first exposure to no-fall zones and technical spring skiing. Appropriately named after this peak, Ortovox’s ski-touring jacket is perfectly suited for those technical missions where breathability, freedom of movement, and durability is key for success. The shell is a breathable and water-resistant nylon that’s stretchy and articulated for unimpeded range of motion. The front half of the jacket features a Merino Punchhole windproof layer to take the bite off the wind, while the back remains breathable and leverages your pack to shield you from the elements. Two humongous Powermesh front pockets are designated for skins, but you can use your creativity when filling the pockets. Athletic fit and Merino Naturetec Light allows ample range of motion, a necessity during technical climbs and descents. The Storm Hood will sneak underneath a helmet for frigid belays and dawn patrols. Ortovox encourages you to be picky with your core temperature and demand nothing less than the best, that is why pit-zips and a 100% Merino lining can be found on the Col Becchei. 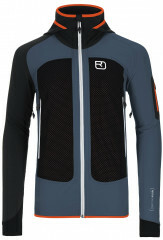 The gives the jacket supreme temperature regulation and sweat-wicking performance. Sustainable production, stylish design, and award-winning performance? The Ortovox Col Becchei keeps saying, “check”. Great as an outer-layer or a mid-layer in super-cold temperatures. Strategically placed zippers and Powermesh pockets are backpack compatible. Athletic fit and articulated stitching helps maximize range of motion. Storm Hood fits underneath a helmet to keep you warm in frigid environments. 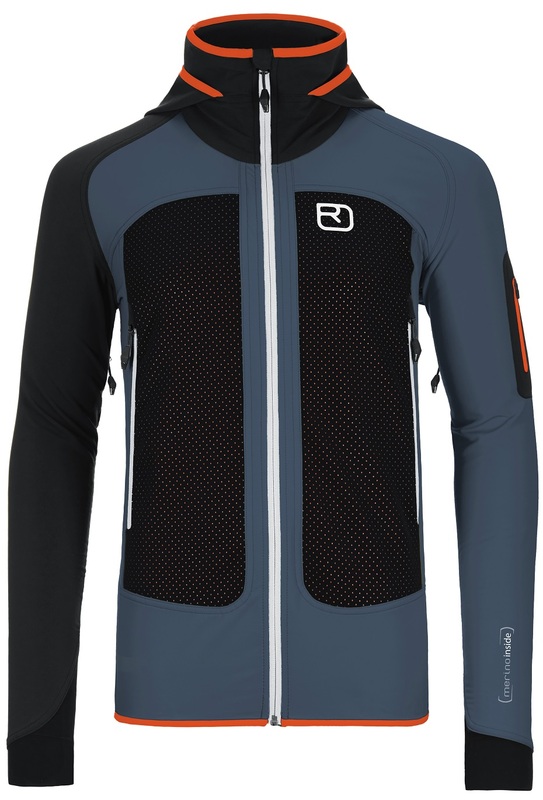 Merino Punchhole front layer keeps warmth in and wind out. Bonded upper arm pocket fits an inclinometer, pocket knife, or Voile scraper perfectly. Polyamide outer shell is abrasion resistant, weatherproof, and breathable. Two underarm pit zips provide excellent climate control. Elastic cuffs seal out the elements and keep you warm. Bottom Line Stylish, functional, sustainable. 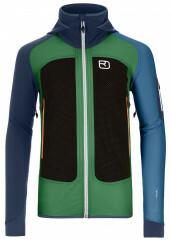 I have a number is soft shell type jackets and this is the favorite, excepting situations where I’d need a wind stopper. The fit is spot on, the venting is excellent. While Jonathan’s comment on the arm pocket is fair I wouldn’t want a large pocket there, since it mostly for a balm or RF pass. An inside pocket would help the phone issues. I think I’d prefer the skin pockets to be Napoleon style. They are situated far back for stuffing skins, but are much larger in opening which is great, vs a Crazy Idea race size pocket. I don’t race but this piece would be warmer than it’s peers like Crazy Idea and less breathable. That I prefer for winter use. I also like the proprietary wool for climbing or skiing and have generally not had other pieces work so well for both activities. Finally, the look. I was a bit apprehensive because I don’t like a lot of logos. This works them into a design which everyone seems to like, at least in the blue. Size is right, arm and hem length excellent, cut lean but not constricting.  Made me want to add items from this brand: top quality as are the probe and shovel I have. Five stars for a very nicely designed skimo-specific softshell. Only significant drawback is that I would have preferred that the smaller third pocket not be quite as small. I've used many different soft shell jackets for ski touring over the years, but the only one I've had with any skimo-specific features is the old Dynafit Breath jacket. The Col Becchei is similar in many ways, but Ortovox's focus on Merino wool is definitely apparent as the jacket has a high-tech feel in many ways yet still provides a sort of soft comfort derived from the use of materials that have some relationship to the natural world. 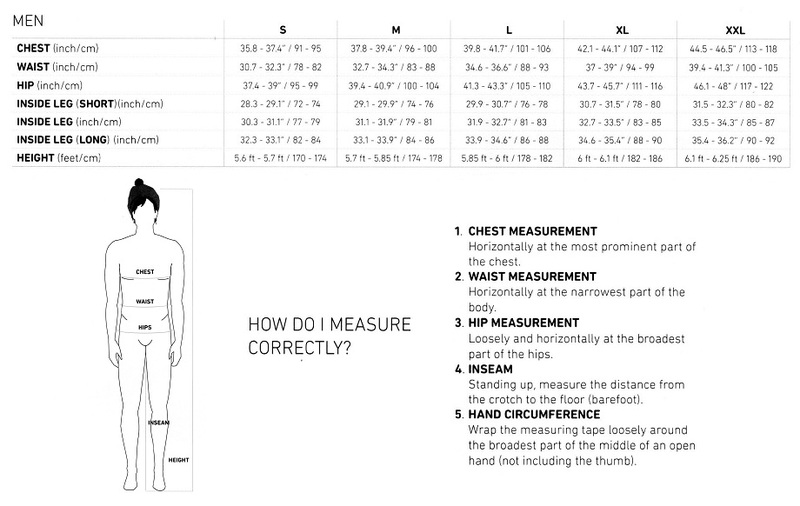 The fit is pretty accurate based on the official size chart, with a generous length in both the torso and arms in a good way, i.e., it won't ride up on you to expose bare skin. The two front zippered pockets are indeed "humongous": I can stuff in the La Sportiva skins for a 172cm Vapor Nano, even though for a Euro momix design they are definitely on the stiffer and bulkier end of the spectrum. I can even stuff in a pair of such skins in a single pocket, which is especially helpful since the pocket on the upper arm is too small for a smart phone. Note that the large front pockets are essentially sealed up very well against the elements, but have a fine mesh layer against your body. So good for keeping your skins warm, but could be considered a drawback if you don't want cold snowy skins that close to your base layer. The hood is very cleverly designed to stow away when not in use, with a stand-up collar that is entirely separate from the hood. The pit zips (with a generous length too) are somewhat unusual for a soft shell, but with both pit zips and the main zipper opened up all the way, the jacket really opens way up. 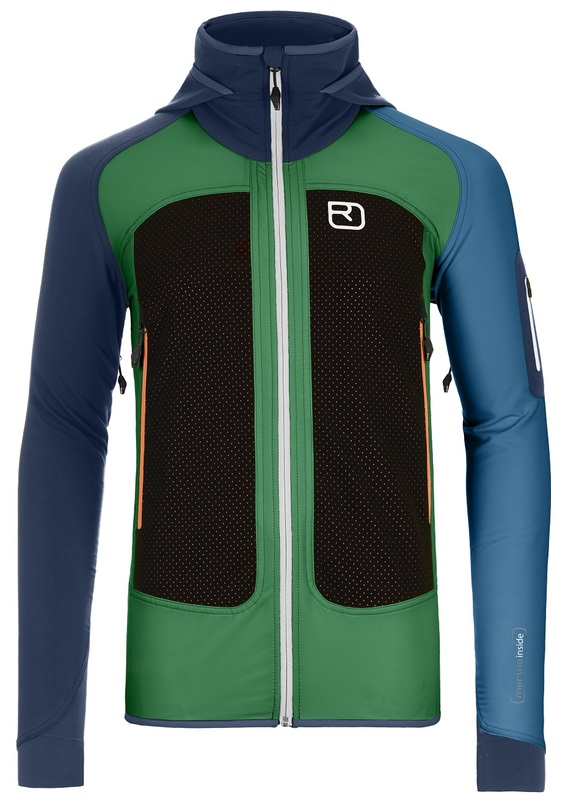 So a great choice for being able to skin up without removing your jacket during winter touring, as well as a great choice for a top for skimo racing if you don't want to be clad in the more typical advertising-festooned lycra.